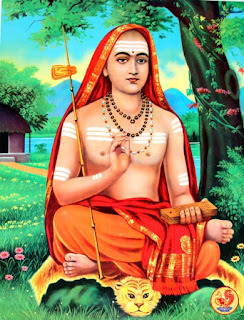 Sri Sankara Bhagavatpada is the principal, though not the first, exponent of the Advaita Vedanta, and he systematised the works of preceding philosophers. “The Advaita taught by Sri Sankara is a rigorous, absolute one” observes Swami Sivananda. Bhagavatpada was the exponent of the Kevala Advaita philosophy. His teachings can be summed up in the following words: “Brahma Satyam Jagat Mithya, Jeevo Brahmaiva Na Aparah” - Brahman alone is real, this world is unreal; the Jeeva is identical with Brahman. So a correct understanding of his usage of the terms, Brahman, Satyam, Jagat, Mithya and Jeeva is necessary for proper comprehension of his philosophy. His philosophy is based on Upanishads, Bhagavad Gita and Brahma Sutras and so his Bhashyas of the Prasthana thrayi form the central texts in understanding his philosophy. As per Bhagavatpada’s philosophy there are three orders of Satyam, reality, viz., Paramarthika Satyam (absolue reality), Vyavaharika Satyam (relative reality or transactional reality.) and Pratibhashika Satyam (reflective reality). Absolute reality is the unchanging Reality that does not undergo any change in all three times; past, present and future and is always the same. This is the Pure Existence defined in Upanishads as Sat and that is Brahman. Vyavaharika Satyam is the transactional or empirical reality. This has experienceability, transactability and utility but has no absolute Reality and that is the Universe. Reality of day and night is an example of Vyavaharika Satyam. Pratibhasika Satyam is apparent reality like the mirage water, seen as water but not available for use as water. Object/event experienced in dream is an example of Prathibasika Satyam. Brahman with this inscrutable, undefinable power of Maya manifest is called Saguna Brahman or Iswara. Saguna Brahman and Nirguna Brahman are not two Brahmans, one the antithesis of other. It is the same Brahman from two different points of view, one Paramarthika point and the other Vyavaharika point. Nirguna Brahman with power of Maya manifest appears as Saguna Brahman, Iswara and Iswara is the personal God whom the devotees worship. So the question of superiority or inferiority does not arise between the two though one maybe called Para Brahman and the other apara Brahman to distinguish between impersonal and personal Supreme. Mithya is not illusion, it is vyavaharika satyam. So Jagat, the Universe, a product of Maya, is not an illusion. As vyavaharika satyam it is available for experience, transactions and is useful but it is not absolutely Real, and it is only the unchanging Brahman that appears as the changing Universe through Maya. Maya through its two powers, avarana sakthi, veiling power and vikshepa sakthi, projecting power, veils the unchanging Brahman and projects the changing universe as adhyasa. As the unchanging Brahman only appears as the changing universe through Maya the universe has no independent Reality and hence Mithya. Jeevathma, is the real Self of the individual, Jeeva, who is a combination of Self, Jeevathma, and non-Self, anathma. The entire body-mind-intellect complex is anathama and material and Jeevathma is the life force that lends sentiency to anathama through its manifestation in anathma. Jeevathma is Pure Consciousness, Chaitanyam, and is not different from Brahman, Paramathma. Maya as anadhi avidya masks Jeeva’s real nature as Brahman and projects anathma as its real nature. Under the influence of avidya an individual Jeeva mistakes its real nature as anathma instead of as Jeevathma. Avidya includes not only ignorance but also erroneous knowledge. So the individual Jeeva thinks it is finite, limited and separate from Paramathma and other Jeevas and suffers samsara. Moksha or Liberation is ending the influence of avidya through Jnanam and realising one’s essential nature as Brahman. When one acquires the knowledge of one’s true Self as Brahman and is firmly rooted in that knowledge, avidya ends and one attains Jeevanmukthi, liberation while living. The identity of Jeevathma with Paramathma, called JeevaBrahma Ikyam, is an important aspect of Sri Sankara Bhagavatpada’s philosophy. Another important aspect of the philosophy is adhyasa. Adhyasa means superimposition or false attribution of properties of one thing on another. For example, when a rope is mistaken for a snake in dim light, there is adhyasa of snake on the rope. It produces the same effect on the seer as the real snake, the reaction of fear etc. This reaction of fear etc. lasts so long as no light is shone on the rope and when light is shone, its real nature is discovered and fear etc. goes. In the case of Jeeva there is mutual adhyasa between anathma, body-mind complex, and Athma, so that the intrinsic nature of Existence and Consciousness are attributed to anathma and actions and experiences of anathma are attributed to Athma, which is really akartha and aboktha. So the empirical ego is mistaken for transcendental ego causing samsara. With spiritual enlightenment, adhyasa ends and samsara goes. So in a nutshell, in Kevala Advaita, Athma is one only without a second. Free of all upadhis and with Maya unmanifest, it is called Brahman. With universe as upadhi and Maya manifest, it is called Iswara. With Maya active and adhyasa operating, it is called the efficient and material cause of the universe. With Sareera Thriam as upadhi and with Maya as Avidya, it is called the Jeeva. But only the upadhiless Athma, that is Brahman, is absolutely and unconditionally Real, all else either relatively Real or apparently Real, if not unreal. Great enunciation in the Part II. Thanks and congrats. May HIS grace be on you cent per cent to carry on for years and years.